One of those days when I was all set to travail across the city, to the other end of the world, well not nearly other end, or of the world, but I was headed to Velachery. Yep, you read it right.. Managed to wind up work, and headed out around 5.30, as a bunch of us had decided to do a mini meet at Pheonix Market city, the newly opened mall. Surprisingly, it took me less than half an hour to reach the mall. Spent about an hour there and were once again on the road. 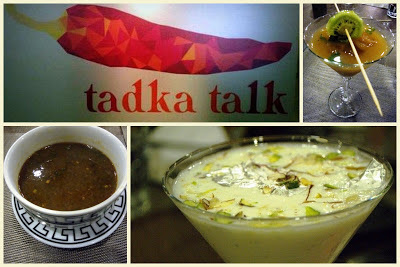 This time to a restaurant in that part of town, Tadka Talk, behind Chennai Business School. 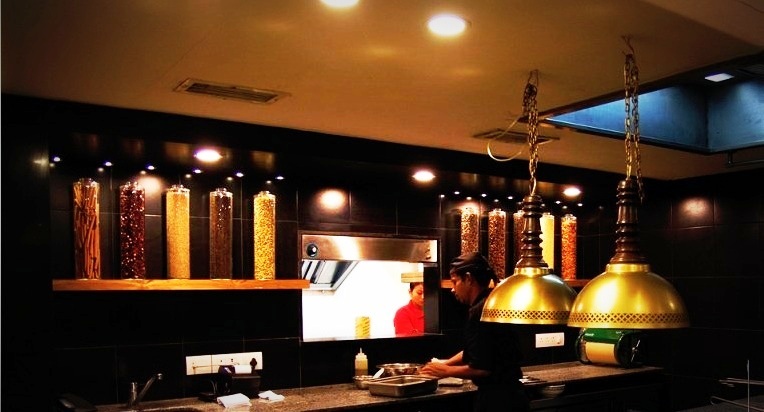 Tucked away in a narrow lane, the restaurant is one you just might miss if you dint know the location or its existence. 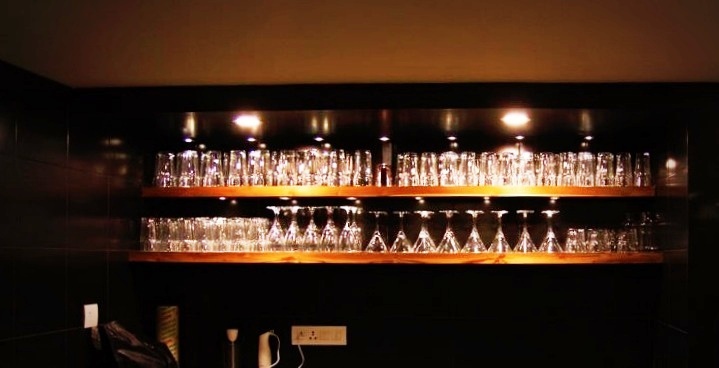 Had been hearing rave reviews about it, and a few who attending the Tasting session also spoke highly of the place. The first thing that catches your eyes as you make your way to the restaurant is the Gym, it is right there, in front of your face. Came to know there were service apartments upstairs and the gym was part of amenities for those who stayed there. Was received by Shafee, the man who owns the restaurant. As we walked in through the thick glass doors, I fell in love with the light fixtures hanging in the corner. The reflection on the wall was beautiful. Noticed a small washroom, and we made a beeline for a quick wash. The restaurant has 2 seating areas, with enough space between the tables. There were a few seating area near the wall, with a park bench of sorts with colourful cushions. On the other side is an open kitchen, where we could see the dishes being cooked, while the tandoor was inside the kitchen. The evening began with a welcome drink - Spiced kiwi & raw mango served with a slice of kiwi on a skewer. I quite liked it, though it did remind me of Hajmola, and Jaljeera. Another drink also did the rounds, it was a Kesar badam lassi, and I liked that more than the kiwi drink [I like yoghurt based drinks]. 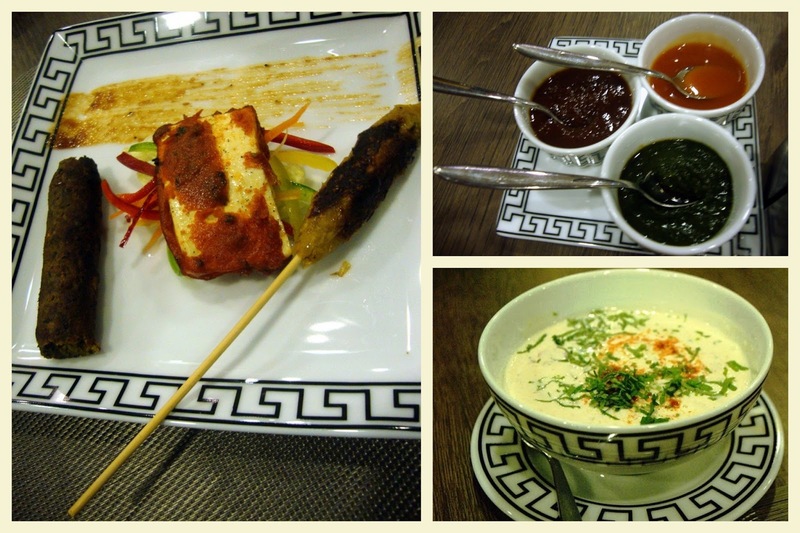 These were served alongside three kinds of chutneys- A raw mango one that I loved, Tamarind & date chutney and ofcourse the quintessential Green chutney [ coriander, mint & green chillies]. There was also a bowl of Cucumber raita on the table along with another small cup with a pickle of sorts. For the main dishes, we had the Lahori Subji Biryani [ almost like a pulao overdosed with masalas] served along side 3 gravies- there was the Phul Aloo [potato cauliflower curry], it was dry and tasted ok, wish it had a bit of gravy. The highlight among the mains was the Kadai Paneer, with nice big pieces of Paneer. Then came the Rajama, which was a dish I was looking forward but it was a let down[to be brutally honest, tasted like the one you get the ready to eat packets]. Apart from these, we sampled an assortment of Indian breads: Roti, Butter Naan and Kulcha Paratha [all 3 were good]. I was busy playing with Arnav that I dint take any pics of the main dishes. You can check them out at Deepa & Divyan's Blog.. 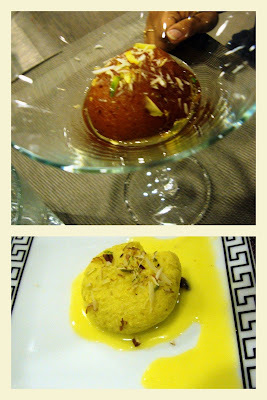 There was suddenly talk of Gajar ka halwa and my mouth began watering [ I like a well made hot gajar ka halwa], but alas, we were served two other desserts, the Gulab Jamun [warm & good] and Rasmalai[dint like the overpowering rose water essence that dominated]. And with that the dinner came to an end. My final verdict- well, if you live around Velachery and are looking for a pure veggie restaurant, you can head here for a simple meal. Let me know what you think of it.